The Genoa boat show was the most natural place to announce the establishment of A.M.Y. - Admiral Mariotti Yachts - which unites the Ceccarelli family, owners of Cantieri Navali Lavagna, and Marco Bisagno, chairman of Cantieri Mariotti in Genoa, with view to entering the market of 38 metre plus superyachts in steel and aluminium. 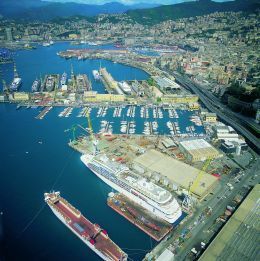 These two important Ligurian shipyards will bring to this new sector the qualities and skills that made each of them emerge in their respective fields. Cantieri Navali Lavagna, with the Admiral brand, is one of the most appreciated producers of planing motoryachts in aluminium, both open and fly, whose absolute level of customisation won them a place in the tough niche of top luxury yachts. The Mariotti shipyards have also had to do with the luxury market, but in the cruise ship sector where they can boast considerable specific know-how in design and construction of metal vessels. Marco Bisagno and Francesco Ceccarelli, general manager of Cantieri Navali Lavagna, have come to an agreement on the important opportunity offered to both brand names by a market that demands increasingly large, comfortable and luxurious boats, a market to which each yard can bring such an added value as to guarantee a successful enterprise. For the occasion there was also a presentation of the first vessel that the joint venture will produce. 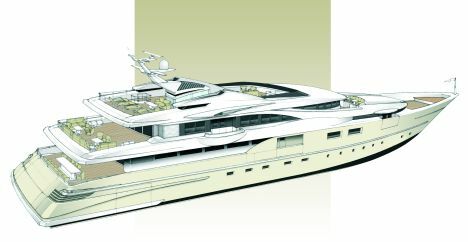 Luca Dini was called in and has designed a 52 metre yacht, developed on 4 decks and of great aesthetic impact. With a 10.50 metre beam it is decidedly spacious, but also rich in technical content that raises its status. Such as the adoption of a displacement hull which gives the yacht a maximum speed of 17 knots and a long range speed (4.600 nautical miles) of 11 knots, but also the ability to face heavy seas in maximum safety and comfort. The hull will be in steel, while the aluminium superstructures will have an up-to-the- minute design, though absolutely without excesses. To satisfy the requirements of those who want to fully experience the sea while aboard a 52 metre ship Dini has designed a stern which exploits its volumes both as a normal hangar for tenders and jet-skis - sea access is by means of side gates - but also gives the owner an enormous "beach", obtained by opening the transom, which can be equipped as a sundeck at sea level or as a gym, living area etc.. The external decks too are extremely vast and can therefore be exploited for enjoyment. The interiors will certainly be the same, created tailor-made in the Admiral tradition. Another interesting functional-aesthetic aspect is the base that supports the aerial mast, substantially a transparent parallelepiped which, over and above streamlining the mast, gives considerable light to the areas below. Great design and constructional emphasis will be placed on maximum vibration and therefore noise reduction, offering the owner a vessel that is all the more comfortable and liveable. Class: Lloyd's Register of Shipping - MCA Compliant.